Cinnamon grows on trees. You can tear a piece of bark off a cinnamon tree, chew it and taste an earthy version of a Red Hot candy. The majority of the Cassia variety of cinnamon comes from one long valley on Indonesia’s Sumatra Island. The Kerinci Valley descends from the slopes of the 3,805 meter Kerinci Volcano, a perfectly conical, geothermally active pyramid of a mountain. The valley makes a donut hole in the center of the Kerinci Seblat National Park, one of SE Asia’s largest parks and home to the endangered Sumatran tiger, among many other things (including the mythological Orang Pendek, a bipedal, human-like jungle creature believed to be related to the orang-utang. Despite periodic bursts of scientific interest, only anecdotal sightings exists). The people of the Kerinci Valley are farmers. One of the world’s largest tea plantations blankets the rolling hills with the bright green tea plant, its tops meticulously trimmed each day, making it look like the birthplace of English garden shrubbery. Outside the tea fields, small family farms thrive: potato, carrot, cabbage, mandarin, lettuce, corn and rice. Increasingly, Arabica coffee is being thrown into the mix. Between the well-kept row-crops grow banana, plantain, coconut, avocado, cassava and cinnamon trees. The cinnamon trees often make long, tall, red-leaf-crowned picket fences between farmer’s fields. Because it’s a tree and won’t rot if it’s not harvested at the end of a season, farmers will often wait to chop one down and collect the bark until they need cash for a home improvement, health cost or child’s schooling. 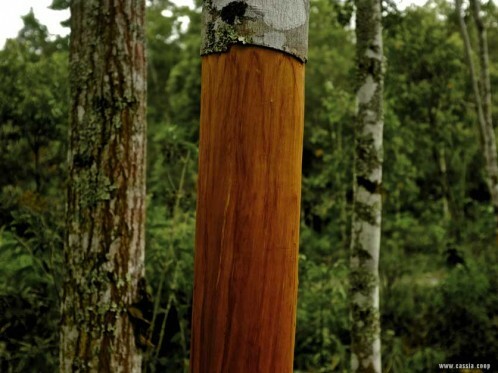 After being cut, a new cinnamon tree usually begins growing from the original stump. Last month my brother and I spent some time with a cinnamon farmer. He farmed a steep forest in the corner of the Kerinci Valley, near the National Park. His father, grandfather, and great grandfather had all managed the same slopes. The process has changed very little. The farmer and some family members hike into the forest with their lunches and tools. They spread out among the trees, peel the lower three meters of bark, then cut the tree down with a machete or small ax. Then they peel every square inch, all the way to the thin branch tips. The bark’s rough exterior is shaved off with a rudimentary peeling tool, like a bulky carrot peeler. Once a few days’ haul is collected, they load it onto a rough-cut wood sled. A buffalo drags the half-ton sled of cinnamon down the jungle slopes to the farmer’s house. There it will be stacked in neat piles on the porch and throughout the house for drying before moving onto the processing facility and payday. After spending the day in the cinnamon forest, we walked into the farmer’s house where bundles of tightly packed cinnamon sticks, some curled as thick as an adult wrist, took up half the floor space. It smelled like a gift shop at Christmas. I’m back home in Hood River, Oregon now but when I shake cinnamon onto my oatmeal I think about tigers and volcanoes and cinnamon houses and buffalo, and I wonder if the Orang Pendek lives among them.